Enclosed porch for dining, reading,games, and naps. Living room: board games and books available. End of street has a pedestrian path to backside of Main St. Basement: family bikes are available for use at your own risk. 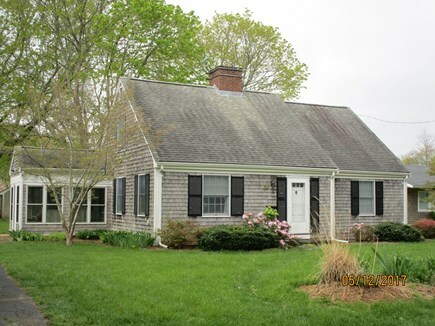 Welcome to our upgraded quintessential Cape Cod home. Four generations of our family have enjoyed this home and great location, and we hope your family does too. 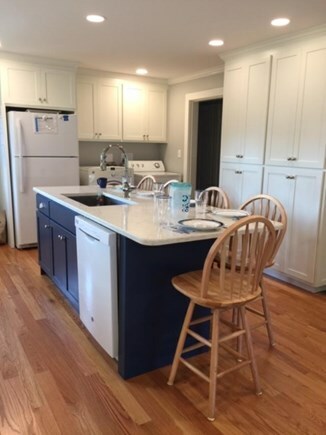 In 2018 we completely renovated kitchen with white shaker cabinets, Blue island with seating, quartz counter tops and new appliances. 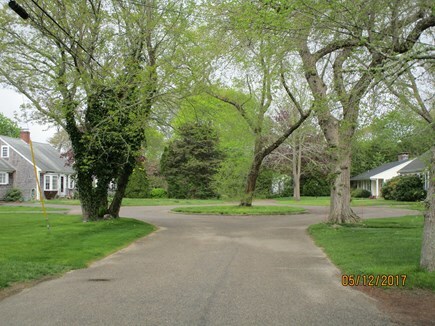 The home has a great yard for relaxing or family games, AC, Wi-Fi, linens,dishwasher, washer/dryer, and cable TV. We are on a quiet cul-de-sac and everyone else is a full-time resident. If you are looking for a centered location but still want peace, quiet and minimal traffic, look no further. Put in a request and I will be glad to answer any questions. The large back yard gives kids space to play, while adults can sit and talk under the trees or umbrella table while they cook out, have cocktails or just relax. You are welcome to use the yard games in the basement. From the house, you can hear the Nobska Light House fog horn or Island Queen Ferry Boat horn as it returns from Martha's Vineyard. 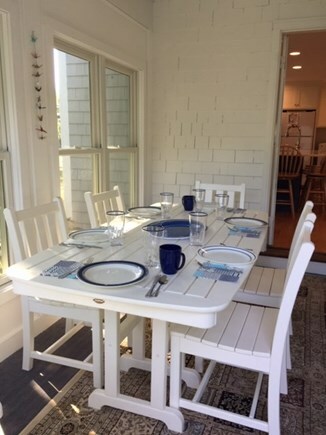 *We are one block from downtown Falmouth and the Cape Cod Trolley Service, which you can take to Woods Hole to see the Aquarium, Titanic Exhibit, dine out or visit the Oceanographic Institute. Do not plan on parking in Woods Hole unless you are very lucky. There are just over 400 paid meters in the area. Take the Trolley. * 2 blocks from the terrific Falmouth School Playground appropriate for all ages and The Carrousel of Light Merry Go Round. *1 mile from the Island Queen Ferry to Martha's Vineyard and the Shining Sea Bikeway. *0.5 mi from The Liberte Schooner which provides a beautiful 2 hour evening cruise. You can unwind after a busy day or walk downtown for ice cream. If you like baseball, the Falmouth Commodores play at the Community Center one mile away. 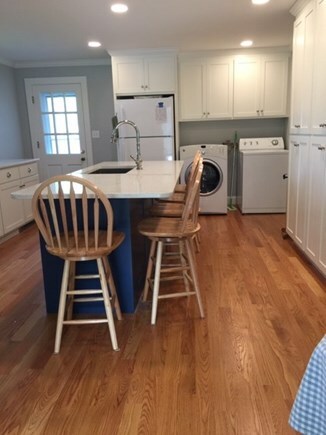 Downstairs has an enclosed porch with dining table and couch, great for playing family games in the evening or reading a book; new 2018 Kitchen with in island for 5 seats; Wi-Fi internet; den with a trundle day bed/sleeps 2 twin; full bath with tub; and master bedroom with queen bed. 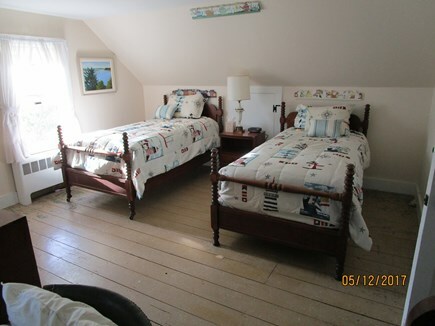 Upstairs has a bath with a shower; a bedroom with three/3 twin beds and #2 bedroom with a queen bed. We have hair dryer in each bathroom. You are welcome to use the beach chairs, crochet set, Frisbees, and toys in the basement. We do have a small stroller, booster seats and beach umbrella. The Falmouth Road Race on Sunday August 19,2019 passes 2 blocks from the house. We hope you give us a look. Please put in a request and we will call you back today. We will answer any of your questions and hope you grow to love Cape Cod as much as we do. Come enjoy the salt air and ocean breeze; collect sea shells that can go into a glass container which is a great keepsake for anyone. Additional availability info: check out at 10:00 AM, check in at 2:00 PM. This is a Saturday to Saturday vacation rental. 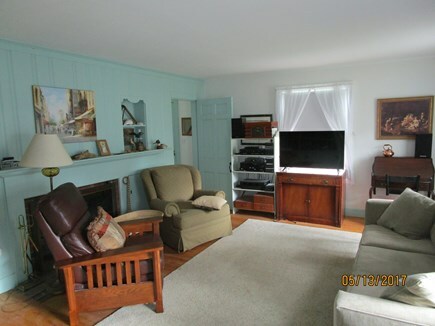 Long-Term Rental (1 month or more): $1,500.00 per month plus utilities. September through mid June. Additional pricing info: cleaning fee is $165.00. If any portion is not charged to us, we will refund that portion to you. State and local taxes of 12.45% will apply. Thank you for a great review. We enjoy having families visit our home and try to provide everything that we would want when traveling. Falmouth is a great place for families. We have young grandchildren and are always trying to improve the home. In late August we painted the public side of the basement, the outside back and side entry areas. Let us know if you would like to return next year. To any and all renters for 2019: Please keep in mind, for wherever you may stay next year: If the proposed tax law is passed, you can save the expense of the 2019 (nearly 15%) tax if a contract is signed before the end of 2018. I have been coming to the Cape all of my life. My Grandfather was with the Woods Hole Institute. My parents bought the home in 1980 and my husband John and I just bought the house from my family in 2017. Coming to the Cape is the annual vacation event for us, our children and grandchildren. 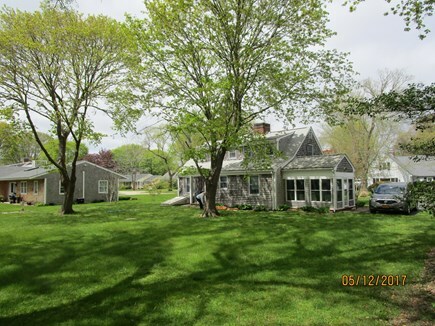 Even if we took a trip to Disney or some other place, we all yearn for our time on Cape Cod. My granddaughter has said she wants to buy the house from us when she grows up. 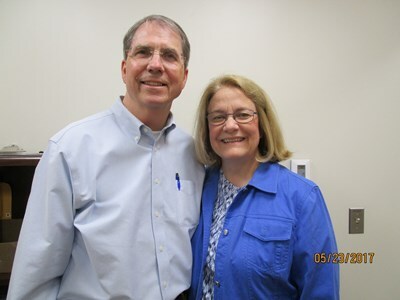 John is an architect, contractor and I am a Nurse Practitioner. We have tried very hard to provide a home that is FAMILY friendly with items that we would want and makes a vacation more enjoyable. The greatest asset is the LOCATION and yard. The ability to have Family downtime whether playing games on the porch, reading books, doing a jigsaw puzzle or playing games in the large back yard. Falmouth Surf Side Beach is 0.7 miles down the road. Main street Falmouth is one block away. You can take the WHOOSH Trolley to Woods Hole and not have to fight parking. Kids can walk to the Ryan Family entertainment center for bowling or arcade games. The Falmouth Road race passes 2 blocks from the house. It is a place to unwind, and reconnect with the people you love the most. We are the only non full time residence on the quiet cul-de-sac. You will feel relaxed on a quiet street and not have to worry about neighbors interrupting or being noisy. Falmouth is a wonderful location. First of all, you do not have to fight traffic all the way out Route 28. We are 15 minutes from the Bourne bridge. 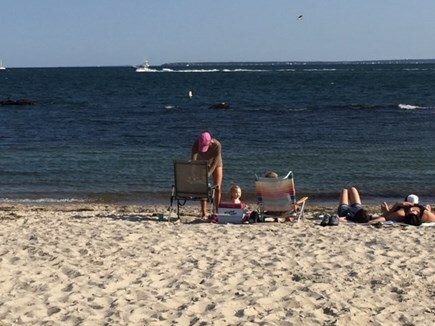 There are places to visit that are fun for everyone: Woods Hole, riding the Trolley, going to the playground, multiple beaches, family oriented or adult restaurants close by, golf, deep sea fishing, boat charters, the Shining Sea Bike path and much more. I send a document to each guest providing a list of activities, places to see, outlet locations or whatever else you may be lookinf for. You can just go sit on the beach,relax under the sun and read a book. Sometimes it is nice to do nothing. Where ever you stay, we wish you well and have a memorable visit.